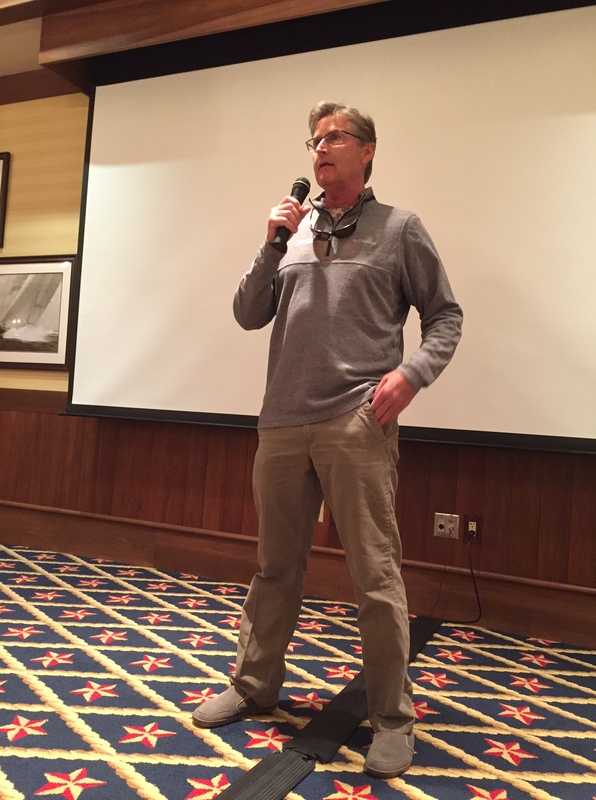 Nine time Bassmaster Classic contender Bernie Schultz spoke to the FFC members at their Dec 13, 2016 meeting. Bernie informed the membership on what lures, and he referred to them as tools, he uses for numerous conditions. 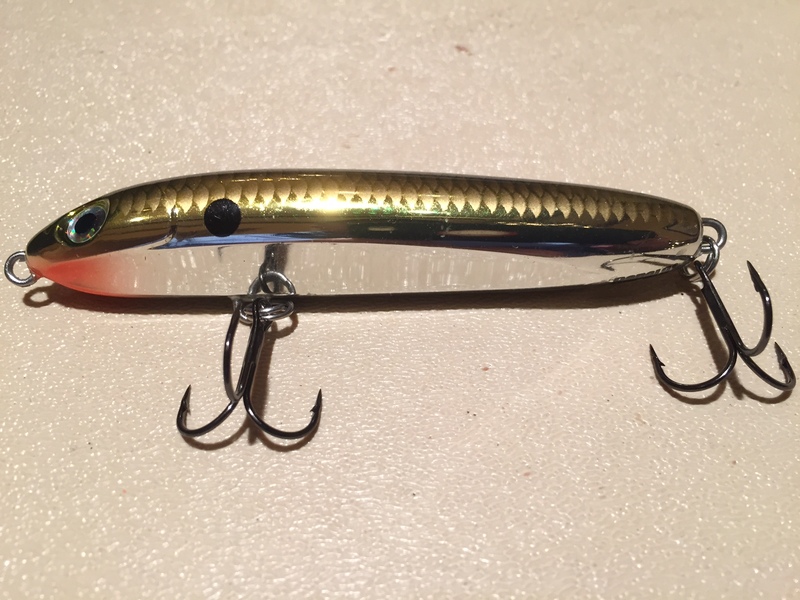 This Rapala sponsored pro introduced us to a new topwater lure that he also helped design called a Skitter V. Bernie passed around several lures along with his rod showing the members what he preferred to use on both fresh & saltwater. Bernie said that he also is an antique lure collector, saltwater angler, and has fished all over the world. 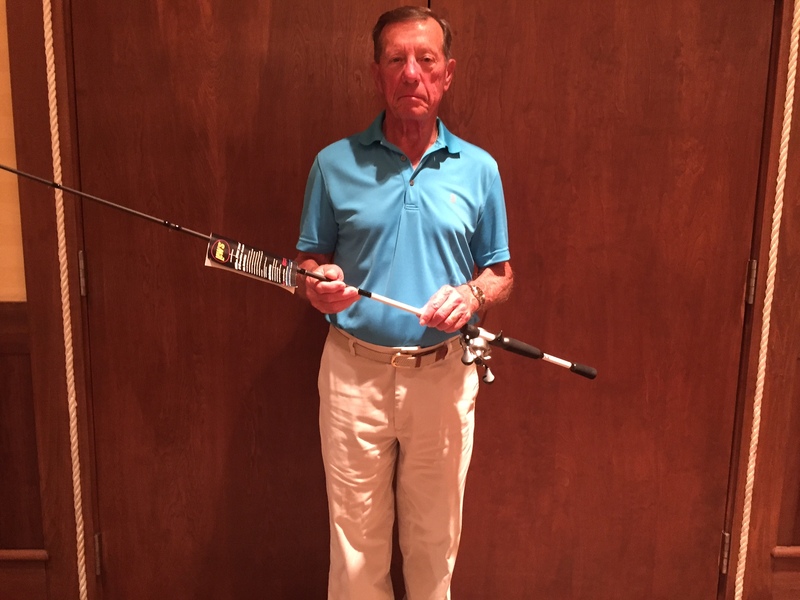 While many pro’s take upwards of 50 rods with them on a tournament, Bernie says he’s scaled back to a dozen but prefers only to have a couple on the deck….this means that he’s successful with what he’s chosen to use for that day. 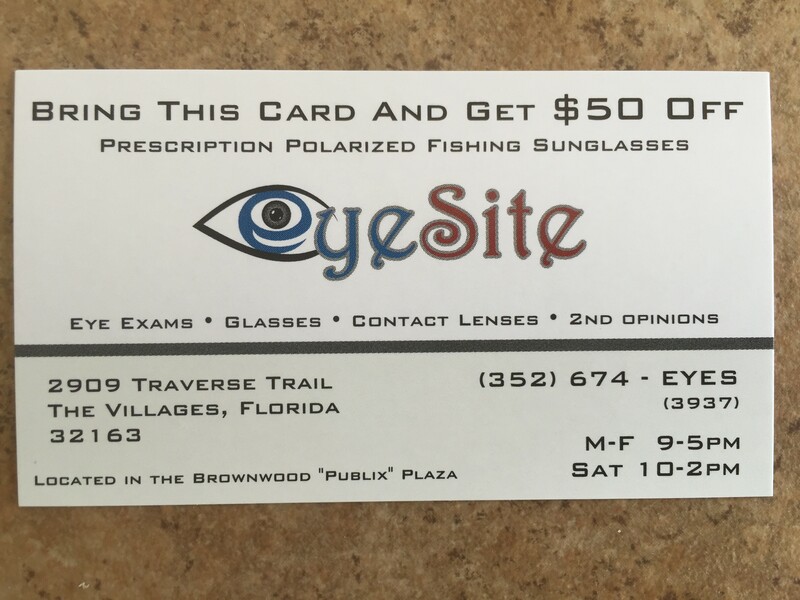 I could be so lucky….recent club tournament I fished in Hernando on 12/13/16 I had a plethora of rods (definition $hit load) on the deck that produced one little squeaker bass. Go to Facebook to see more about Bernie Schultz. Congratulations to jubilant Mel Elswick that won the Lew’s Combo raffle. Brooker Bait & Tackle agreed to spool Mels reel with monofilament for free or 1/2 price for fluorocarbon or braid. 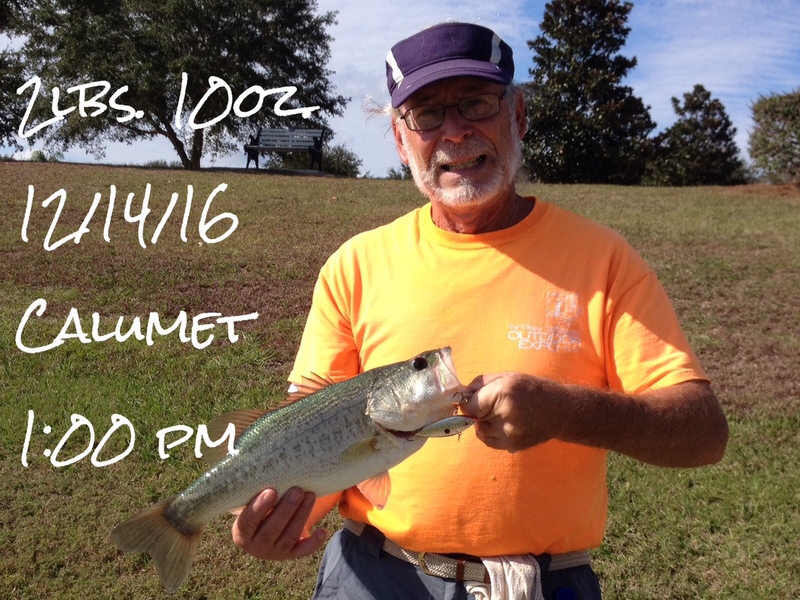 Mel – maybe a Trophy Catch qualifier will brighten your day. The next meeting we want a report on your first fish using your winning outfit. Here’s a beauty being held by Woodbury Village angler Ron Schemer that he caught on 12/11/16 around 5:00 pm at Briar Meadow. 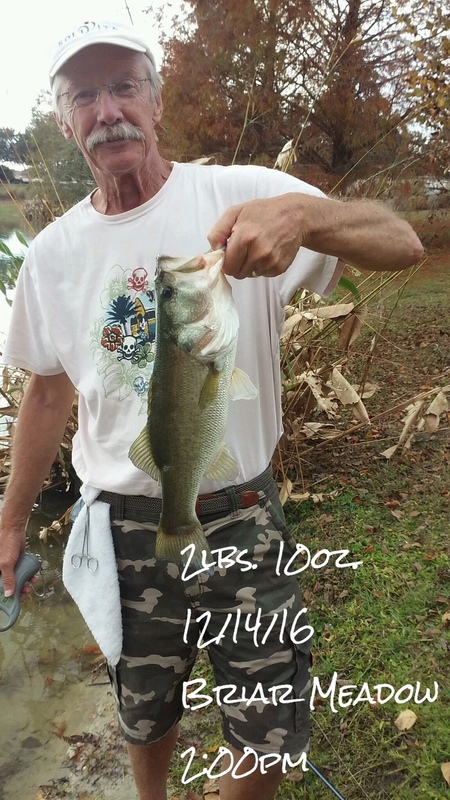 Ron’s bass measured 23 1/2″ long and weighed 5lb 4oz. Don’t know what he caught it on but you can bet one thing, those of you looking at this north of the Mason Dixon line are wishing they were here. Gang this is golf cart fishing at it’s best in The Villages….no boat required. 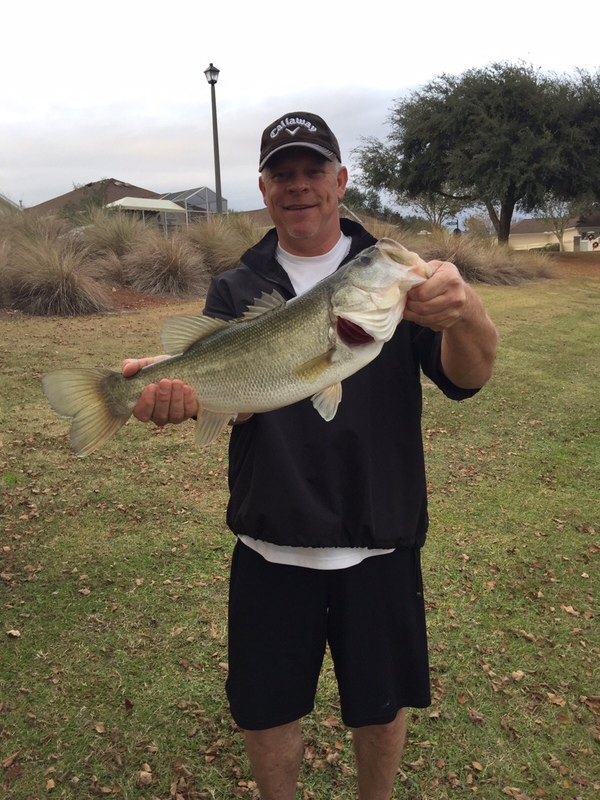 Any pond has the potential of harboring bass this size and MUCH larger. This is hard to beat especially when it’s zero & below this time of year….not here thank God. Cold here today though with expected high of 72. Still waiting for panfish reports. Guess that’ll have to come from the ice fisherman. Name tags are no longer available at Lake Sumter Landing but can be ordered at our monthly FFC meeting payable in advance and picked up the following month. Cost are $6. President Randy mentioned raffling off 25 chances to fish the Promise Ranch near Center Hill, FL. Go to http://pitfishing.com for more info. This could provide you with a fish of a lifetime. Many fishing shows have been televised here. Don’t forget to sign up for this months Lake Harris fishing trip that will launch from Venetian Gardens. Deadline is Dec 16. Contact Steve Felix (352) 753-5211 or (608) 780 0598 or email sfelixlax@aol.com. 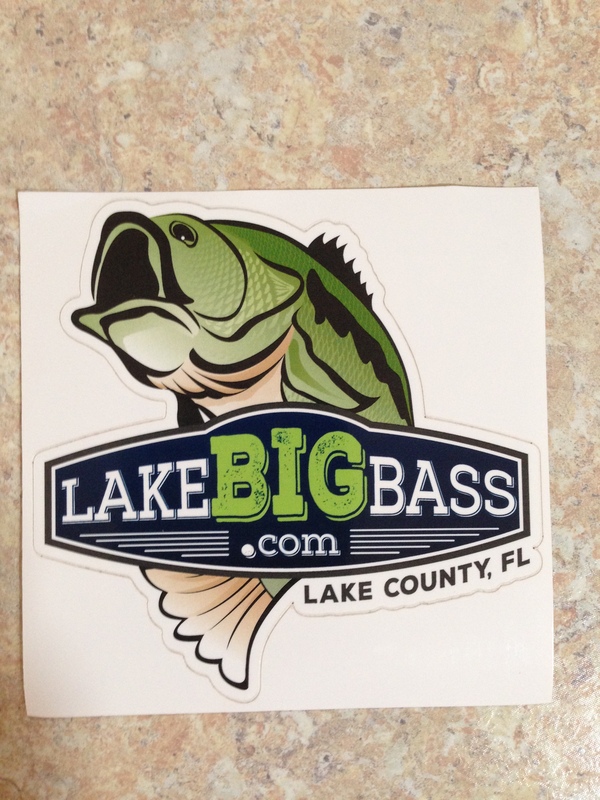 See the Bassmaster Bass Pro Shops Southern Open at Lake Harris launch from Venetian Gardens and lets have a show of support for our own local pro Tim Frederick at the weigh-in. The tournament is Jan 19-21. 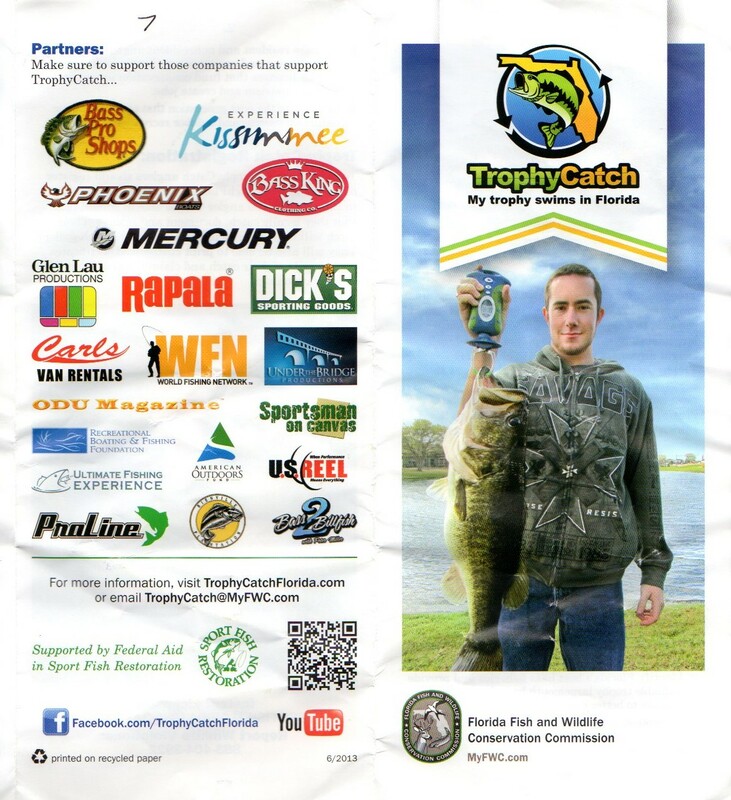 Chris Lane won this in 2012 with a 3 day total of 72 pounds 11 ounces. Upcoming FFC Fish Fry is Feb 18 to be held at Silver Lake Rec Center….sign up at Jan 10, 2017 FFC meeting. You MUST be a member in good standing.